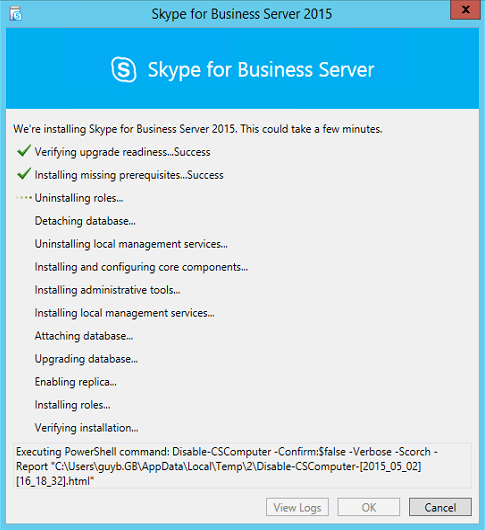 Microsoft released today the new version of Skype for Business Server 2015 to MSDN and I’ve decided to use my Azure Virtual lab to upgrade my STD server. In this post I’ll cover the Offline method. Upgrade the topology from the inside to the outside. 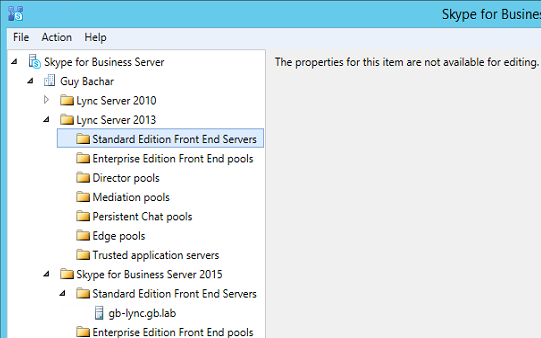 Upgrade the Central Management Store (CMS) pool. 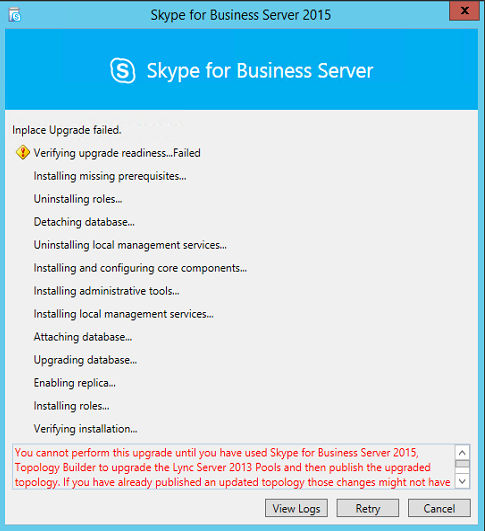 Be sure to uninstall LRS Admin tool for Lync Server 2013 before running In-Place Upgrade. 1. Connect to a computer which is part of the domain but does not have any Lync core components or admin tools installed on it. 4. 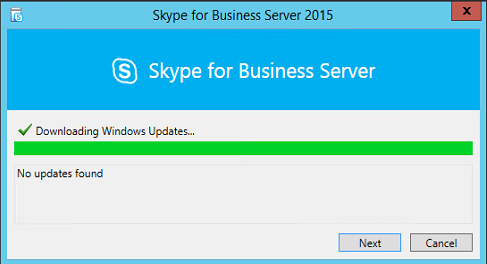 On the Setup screen, choose “Connect to the internet to check for updates” in order to install the latest cumulative updates of SfB Server 2015.
this is a useful changes for future deployment which can save a lot of time installing the CU updates. 5. 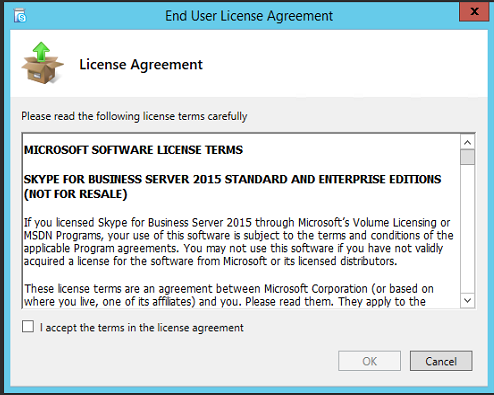 On the End User License Agreement screen, select the “I accept the terms in the license agreement” and choose OK.
9. 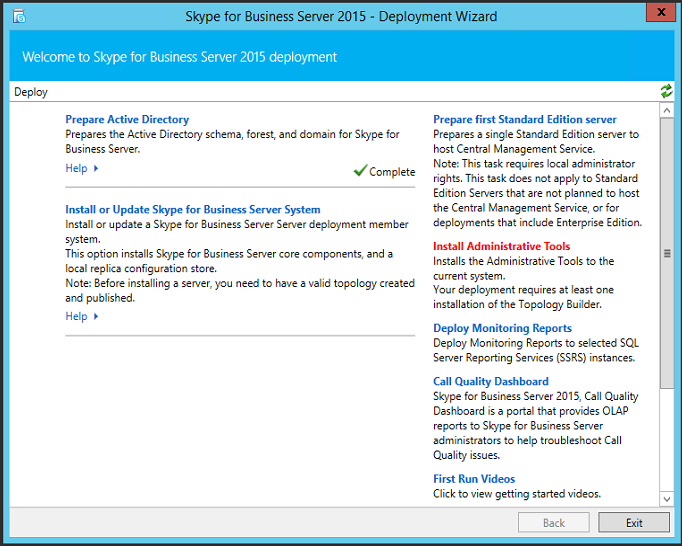 From the Windows Start screen, open Skype for Business Server Topology Builder, Click Download topology from existing deployment, and click Next. 12. 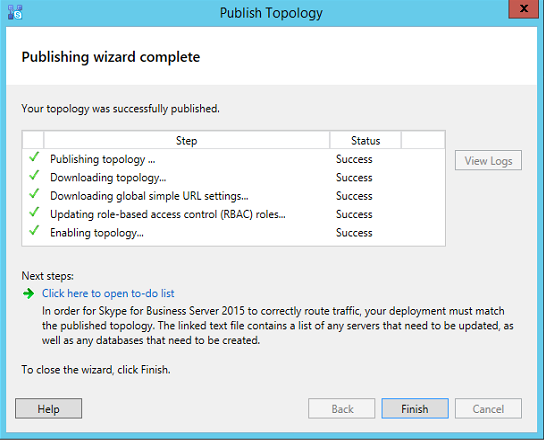 Publish the topology and wait for replication to end. 14. 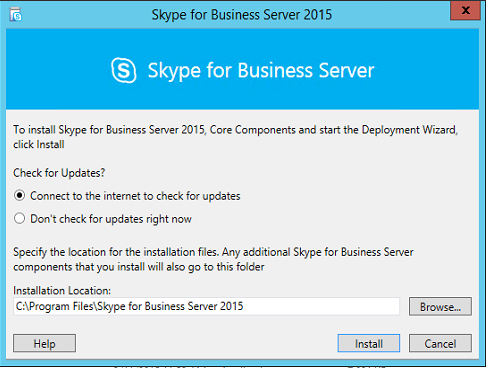 After disabling the services, we need to run the Skype for Business server setup from the ISO file we’ve downloaded. 15. Once initiated, A prerequisites setup will launch and will determine if the current environment is ready for SfB upgrade or not. Please remember that if you performing that on Enterprise pool, you have to go through each of the server before starting the services again. 17. Once the services are up and running, we need to make sure the upgrade was successful, for the pool that was upgraded. Run some tests to make sure the functionality is working as expected. Run the upgrade experience how to deal with this problem? Don’t know how to resolve the issue. Still searching the NET for a solution. Also, can you upload the log file some where? what is mentioned there? Yes, I did try the link you shared. Still same error. Is there a tool like cmtrace that, I use for sccm 2012 to read the log files. I can’t figure out the issue from this log file. I went thorugh the file, other than Product: Microsoft Lync Server 2013, Core Components — Removal failed. it doesn’t say much. Did you try to uninstall it manually from the Program and Features window? 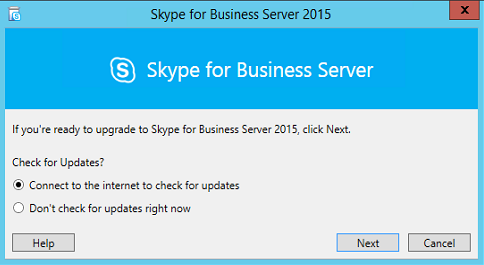 Maybe you can try and reinstall it first using the Lync Setup CD and then remove it see if that helps. Thanks for taking time to read through the log file. 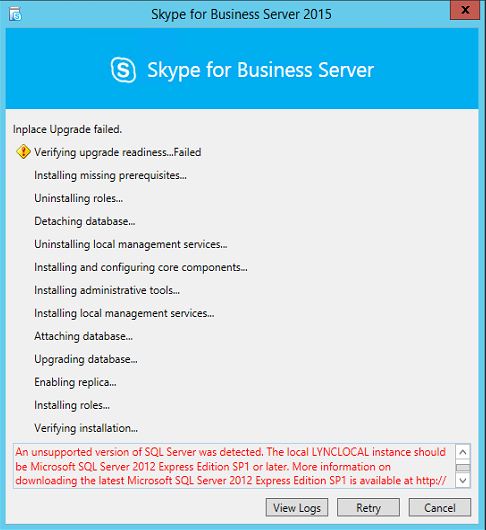 I will remove MS Lync Server 2013 Core Components from Program and Features and run setup,exe from S4B 2015 see what happens. Will update you later. MS just released SCCM 2012 SP2. 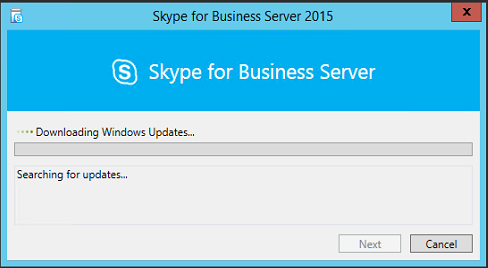 In the middle of upgrading SCCM server to SP2. Tried to remove from programs and features – will not let me uninstall – reason – others applications might be using the service, I did stop all the services yet it will not uninstall. 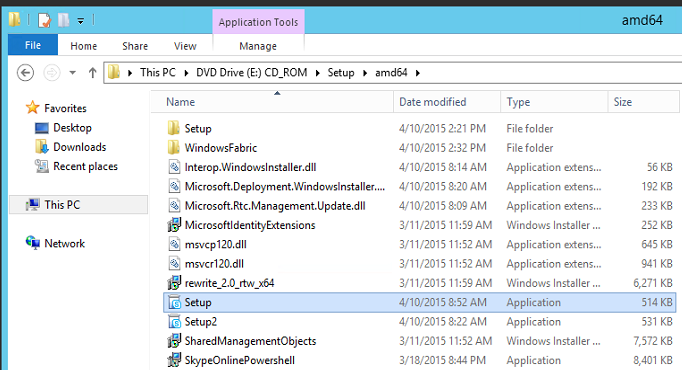 Then, i went with revouninstaller program to remove lync core components. 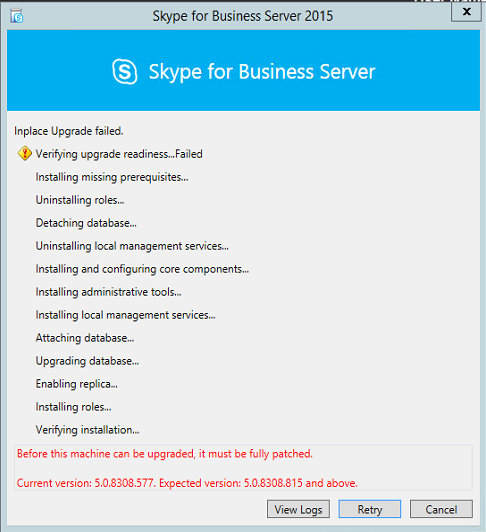 With little bit of fight was able to remove lync core components. I search every where – program file, program files x86 and program data. I don’t see Skye for Business 2015. Can’t figure out the solution. One good thing is it is home lab so I can play around – worst come worst – I will perform fresh S4B 2015 during the weekend.